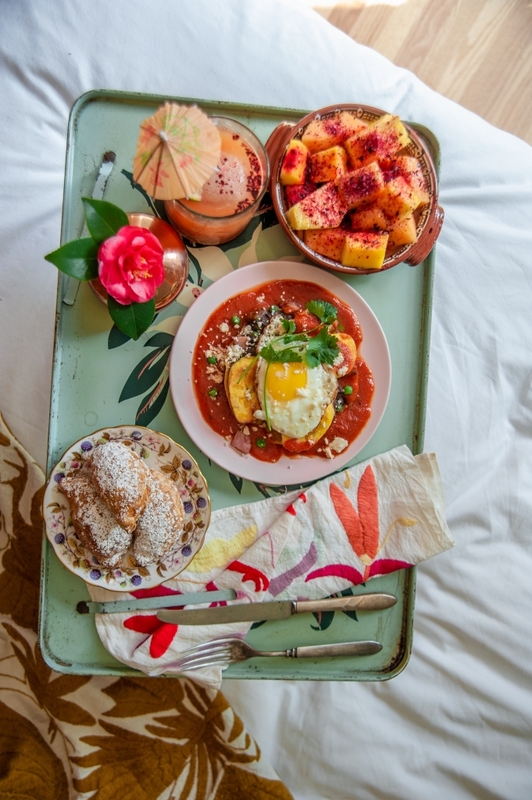 There are few things I love more than a decadent breakfast in bed. 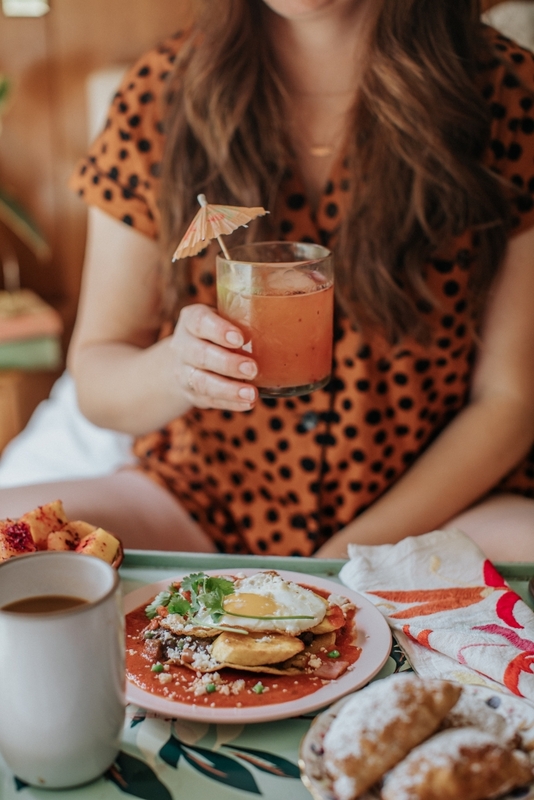 This week i’m inspired by (aka yearning for) my favorite Mexican breakfast treats – Mezcal Cocktails, the best breakfast coffee, and Cocos Frescos plus Huevos Motuleños and Pastelitos! 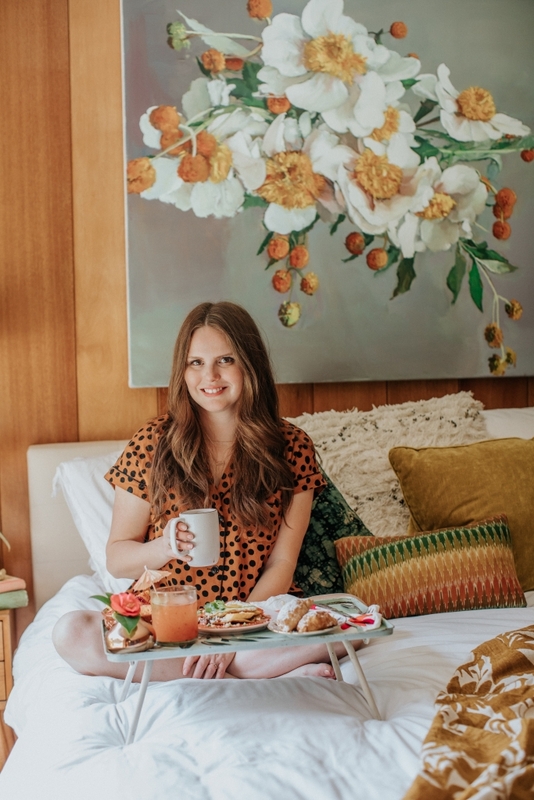 The breakfast beverage is an art, and I’m making two because you can’t have a morning cocktail without a coffee first! 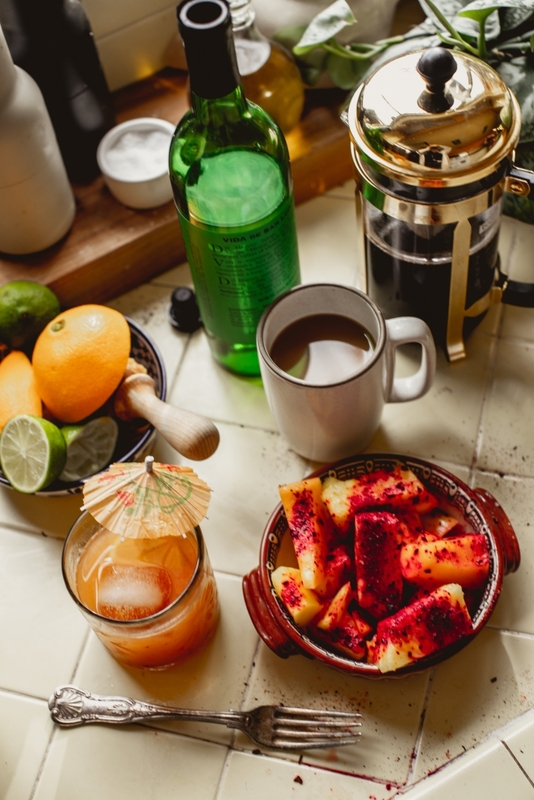 I’ve paired a deliciously easy mezcal cocktail with my favorite breakfast coffee – cafe de olla, and my take on cocos frescos – fresh fruit with spicy chili salt. 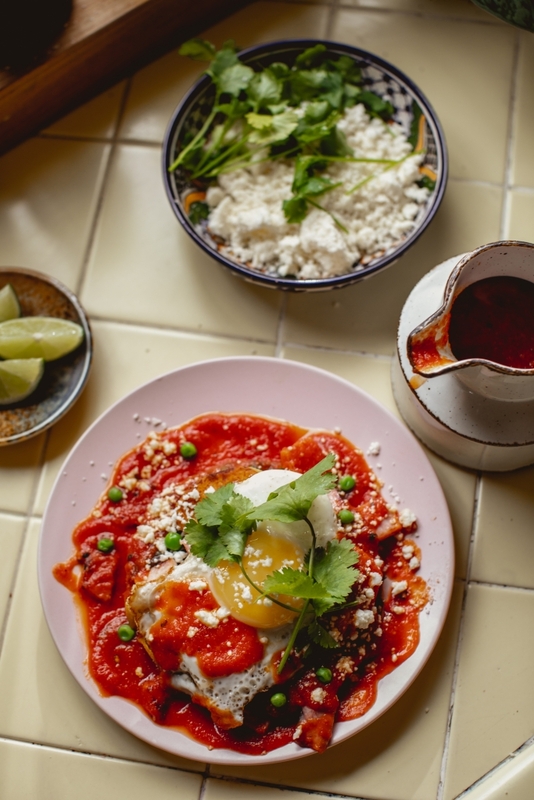 For the main event; fried eggs, covered in tomato sauce, peas, chunks of ham and cheese. 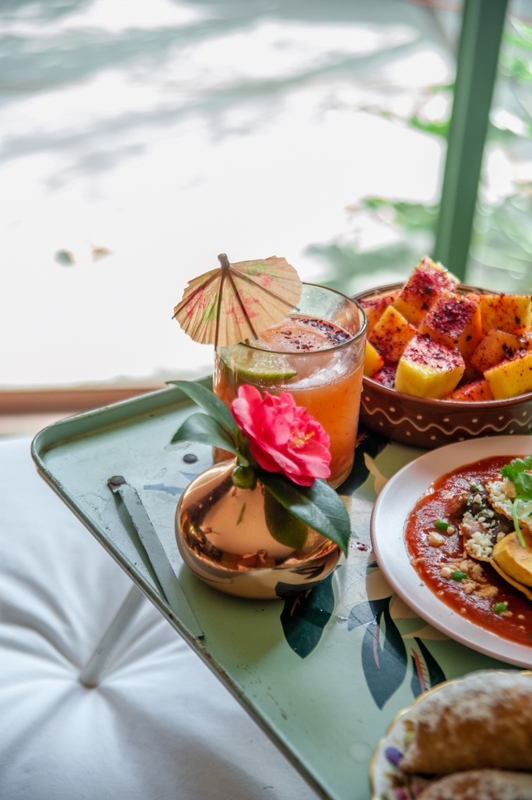 Served over tostadas/tortillas, with fried banana on the side. 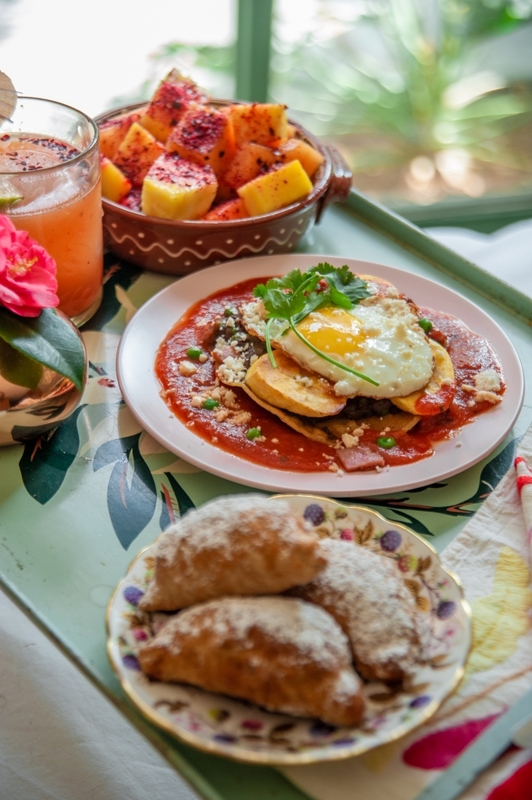 The dish gets it name from the town where it was invented, Motul, in Yucatan state. 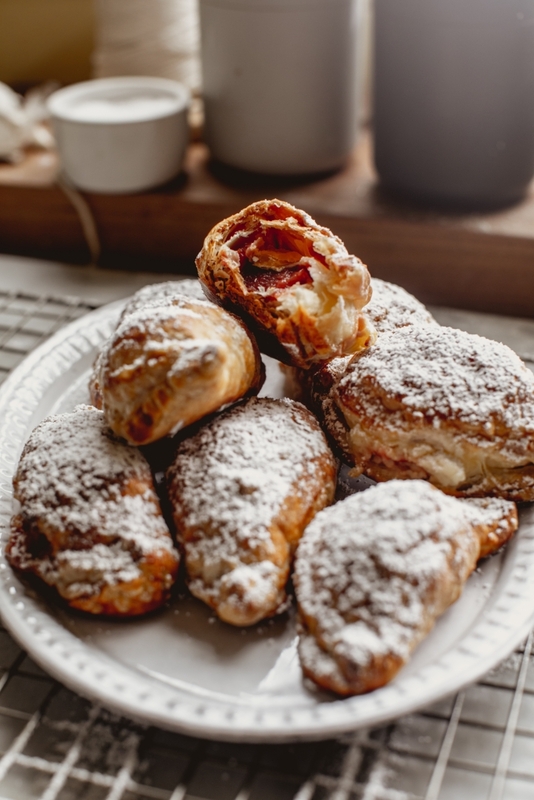 Finishing off with Pastelitos, these powdered sugar—dusted pastries look like delicate white empanadas. In addition to finding them in the bakery, neighborhood women walk door to door selling an assortment of Pastelitos in Yucatecans’ favorite flavors: coco (coconut), piña (pineapple), and camote (sweet potato), or a mixture, known whimsically as atropellado. Today I’m making mine with delicious, slightly sweet guava! Smash the cinnamon with a mortar & pestle. Combine everything in a french press, add boiling water, and stir. Let it sit for 4 minutes. Press down and pour out. I add half and half to mine as well. Blend papaya and sour orange together. Strain into glass filled with ice. Add mezcal and stir for 15 seconds. Strain into glass, garnish with fruit. In a food processor, combine the hibiscus and ancho chili. Pulse until combined and quite fine. Stir with sea salt. To serve, cut up the fruit and sprinkle with desired amount of salt. Fry the sliced plantains in 1 tablespoon of vegetable oil for 2 to 3 minutes per side over medium-high heat in a large pan. Transfer to paper-towel lined plate and set aside. Place the red onion, tomato, oregano, habaneros, and garlic in the pitcher of a blender along with 1/4 cup hot water. Blend until pureed. Pour the puree into the large pan used for the plantains. Simmer over medium heat until dark and thick, about 3 to 4 minutes. Taste and add salt as needed. Transfer to a small serving dish and cover with foil to keep warm. Wipe out the pan and return to the stove. Place the refried black beans, cumin, and garlic powder into the same pan along with 1/4 cup of water. Heat on low and simmer, stirring frequently, until ready to serve. While the beans are being kept warm, bring a second frying pan to the stove and heat 1 teaspoon of vegetable oil over medium heat. Once the oil is shimmering, add one of the corn tortillas and cook for 1-2 minutes, until golden brown. Flip the tortilla and cook on the second side for 1 to 2 minutes until crispy. Transfer the tortilla onto a serving plate. Add another teaspoon of oil to the pan and repeat with the second corn tortilla. Pour the remaining tablespoon of vegetable oil into the pan used for the tortillas and heat over medium-low. One at a time, crack an egg into a small bowl, then gently pour it into the pan. Repeat with second egg. Gently tilt the pan to spoon the hot oil over the egg whites to encourage them to set. Once the whites appear set, spoon the oil over the yolks until they are cooked to your liking. Turn off the heat and quickly smear the refried black beans onto the tortillas (you will have leftovers). Scatter the fried plantains onto the two plates, then top with the fried eggs. Spoon the prepared red sauce over the top and garnish with the pickled jalapenos. Add avocado slices, crumbled cotija cheese, and lime wedges for squeezing as desired. Divide the dough in thirds; work with one-third at a time and keep the rest wrapped in plastic under refrigeration. Place the dough on a lightly floured surface, dust with a bit of flour, and roll out to a thickness of 1/8” inch (3 mm). Use a 4 inch diameter circular cookie cutter or other round form to cut dough into disks. Each third of dough should yield 8 disks. Press together each piece of cream cheese with a piece of guava paste. Place the filling just below the center of one of the dough circles. Lightly brush around the circumference of the disk with beaten egg. Fold the circle in half and press tightly around the ridge of the filling to remove air bubbles and firmly close the Pastelito; use a fork to crimp the edges and seal. Continue until all the Pastelitos have been filled. Bake 30-40 minutes, cool, and dust with icing sugar.